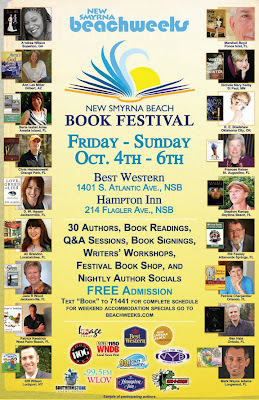 The New Smyrna Beach Book Festival will take place October 4th through the 6Th beachside. The festival features 25 authors representing seven states and multiple Florida Book Award winners. Representing mostly fiction writing – a festival goal was to prioritize great books that both the avid and recreational reader might enjoy reading on the beach on vacation. Featured fiction books include suspense, thrillers, mysteries, poetry, inspiration, kids, young adults, detective and fantasy genres. Author sessions begin every 30 minutes with on-the-hour sessions taking place at the Best Western Oceanfront Hotel on Atlantic Avenue and on-the-half-hour sessions taking place at the Hampton Inn on Flagler Avenue. Sessions will include author instructions, book sales, book signings and presentations on such topics as inspiration for the book, description of plot and characters, dialog readings as well as questions and answers. In addition to selling the featured books at the session, all of the Festival’s books will be for sale at the Festival Book Store at The Best Western Oceanfront Hotel all days of the festival. The Festival also offers a free Writers Workshop on Saturday and Sunday at 3pm at the Best Western Oceanfront Hotel. The Saturday workshop will focus on plot and character development and the Sunday session focuses on getting published. Also each night of the Festival, a special happy hour social meet-and-greet will take place with all of the authors featured that day in attendance in a casual setting. The New Smyrna Beach Book Festival is part of Fall Beach Weeks in New Smyrna Beach – 50 days of festivals in 10 weeks from September 27th through December 1st. The campaign is designed to showcase New Smyrna Beach during autumn and increase its appeal as an off-season vacation destination. For more festival information and special Beach Weeks/Book Festival accommodations call the New Smyrna Beach Visitors Center at 1-800-541-9621. The Best Western Oceanfront Hotel is located at 1401 South Atlantic Avenue and the Hampton Inn is located at 214 Flagler Avenue.